Southeast Buttress begins in a deep clean chimney on the left side of the south buttress of the formation. The south buttress of the formation is comprised of a series of towers in front of and on top of one another. The opening pitches of the Southeast Buttress climb the cleft where the lower towers attach to the main wall. 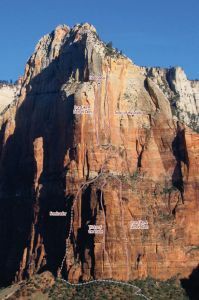 The upper half of the route follows the corners behind and on the east side of the upper south buttress. Which SuperTopo guidebooks include a topo for Freeloader?